I graduated from high school at 17 and enrolled in college the following fall of 1951. I also joined ROTC program at the school and two fraternities–ah, the marvels of college life. 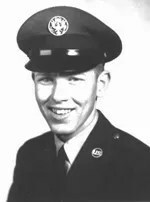 By the end of the first semester and getting several D grades I decided college wasn’t for me and joined the Air Force in February of 1952. My basic training was at Lackland AFB, Texas followed by nearly 10 months going through the Electronics School at Scott AFB, Illinois. Getting there was a bit of a thrill. I wasn’t sure why or how but I ended up on my first airplane ride aboard a C-46 from San Antonio to Scott AFB, Illinois. I graduated from the school in November 1952 with orders to Japan. I went on a 30-day leave to my hometown of Cedar Rapids, Iowa where I enjoyed time away from military life. When it ended I made my way to Chicago where I’d be taking a train to the west coast and hopping a ship to Japan. In Chicago I met up with several buddies right after the New Year. Having them along as company on the trip made the journey a lot more fun. Since we were travelling in uniform every old soldier on board the train insisted on buying us drinks and regaling us with their stories of how they helped win the war…World War II that is. Several days after arriving at Camp Pendleton we were taken to where our ship, the USS General W. H. Gordon (AP-117), was docked. The day we left port–January 19, 1953–is a date I will never forget: My idol Hank Williams died on that date. The highlight of the voyage was crossing the Equator on the International Date Line. 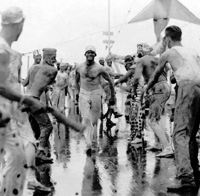 In this ancient tradition Sailors and Marines crossing the Equator for the first time are subject to all kinds of weird rituals. This rite of passage is a daylong affair where pollywogs–those being initiated–are put through many embarrassing obstacles such as being locked in a salt-water coffin, hair chopping, digging through rotting garbage, locked in the stocks while shellbacks–the initiators–throw mushy fruit at them, and other degrading behavior. It was a lot of fun to watch. We arrived at the port of Yokohama 28 days later and took a 4 hour train ride to the Replacement Depot. On the ride there a sergeant came through the car and read off a list of names and where those called would be assigned. He then bellows out, “Anyone whose name I did not call…you guys will be heading to Korea tomorrow morning.” Welcome to the war!! I was sent to Chinhae AFB (called K-10) to the 102nd Comm Squadron. Less than a month later, the 75th ADW Air Police Squadron got their first mobile communications, and a buddy of mine and me were transferred to the AP Squadron. We lived in a pretty secure environment since he North Korean army had been pushed out the area years ago so the actual shooting war was far off. We had some A-26 twin-engine small bombers based at Chinhae and they made quite a racket on take-off and landing–mainly because we had a PSP (Pierced Steel Planking) runway. We slept in tents on canvas cots and in the winter used sleeping bags. We were always envious of the Army guys based not too far from us. We figured they probably had it better since they had steel cots, sheets and blankets. Of significance in that tour, my buddy and I were called down to Chinhae port to work on some HF radio gear located on a boat belonging to Sigmund Rhee, the President of South Korea. We did an excellent job of repairs and had him out of the port in under an hour. The gear we worked on was a Collins Radio manufactured in my home town of Cedar Rapids. One funny story was when our main switchboard reported an outage with the Navy unit in town and asked us to investigate. We got about halfway to town and found a ROK Army unit calmly cutting loose the tie-downs and rolling up our telephone cable connecting us to the Navy base. We never understood why. And who could ever forget the “Twelve-Holer” at the bottom of the hill from our tents. It was a wonderful experience in the winter time, as we wore the old one-piece fatigue uniform and had to half undress to go to the bathroom. Then there were the steel canteen cups we used for everything drinkable including cereal soaked in that wonderful reconstituted milk. It worked well for cool water and orange juice too but not hot liquids. Every time I tried drinking hot coffee my mouth would burn and when the cup finally cooled enough for my lips to touch the metal, the coffee was too cold to enjoy. Oh the joys of Korea! 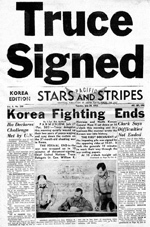 The final armistice agreement was signed on July 27, 1953 and when it was announced there was wild jubilation throughout our base. I rotated out in December 1953 and was the third ship to dock in Seattle, Washington on December 24th. When I and many other returnees tried to get home we found that all ground transportation and air was booked solid. Somehow the military found a train going to Chicago so most of us got out. I remember the one conductor playing cards with a large group of us. As we arrived near Minneapolis we caught him cheating. After the train starting moving we threw him off the train as it left town. The Air Police was waiting for us in Chicago but didn’t take any action. My parents met me and we made the long drive to Iowa, celebrating Christmas on the 30th of December!! 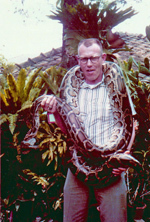 In Vietnam I was stationed at Tan Son Nhut AB near Saigon. I remember the medic almost taking pleasure in showing us the 3 and 5/8 inches long needle used to administer the Hepatitis shot. He then jabbed me in the left cheek of my buttocks. The pain of the serum flowing into my system hurt more than anything I can remember. That shot disabled me for two or three days making it hard to sit or lay down. In December 1966 and again in early 1967 we came under several attacks by Communist Vietnam Peoples’ Army (VPA aka NVA). I was the communications superintendent in charge of a transmitter site and receiver site located on the north perimeter fence. When the enemy made a second assault the .50 caliber machine we had set up on the roof kept them at bay as they tried to breech the fence-line. I was taken aback a day or two later when I saw some of the bodies laid out on the flight line and among them all of the barbers from the base. They were the guys that snapped our necks and gave us a razor cut haircut!! They could have taken us out at any time. It was the only determined enemy attack on the base while I was in-country. I do recall the VPA threw a bomb under our work bus two days after I rotated back to CONUS and several guys were either killed or severely injured. This is what a “crazy and wild” guy does on R&R in Thailand. The snake was 17 foot long and very heavy. My favorite was Suippes Gunnery Range, Suippes, France. I was the acting Range officer and 1st Sergeant, both at the same time. My two oldest daughters were born in Verdun Army Hospital during this tour. I was also the interpreter as our next door neighbors were the French Air Force bombing range and we had to do a lot of coordination. 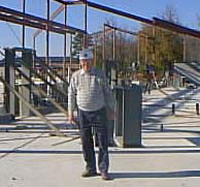 I began fencing again and in 1961 won the 3-weapon championship in Wiesbaden, Germany. I was then selected to Captain the United States Team in Dresden, Holland, which hosted the Council International Sports Military World Championships. We did not win but made many friends and enjoyed swapping war stories, souvenir pins and patches. My least favorite was Viet Nam. To get to the supply warehouse on Tan Son Nhut AB we had to walk through the mortuary services area. That’s where American dead are received, identified, prepared for shipping in metal caskets and returned to the United States. It’s also were they disposed of bloody sheets, et al and put it in the non-stop burning oven. I never could get over the smell of that area and could never get over the sight of ‘six-bys’ loaded with dead soldiers waiting to be unloaded. I think my time in GEEIA, where our team excelled at installing all bases equipment’s either on time or ahead of schedule. In particular when we were in the Azores, there were several contracts that had been performed but never signed off because of deficiencies. My team corrected all these discrepancies and got the jobs signed off by Base personnel when I called back to Harrisburg to tell them all jobs were completed. They told me there were several more jobs never installed sitting in a warehouse. The end result was, instead of the three weeks originally forecast, we spent almost four months in the Azores, but when we returned home, all 17 jobs had been installed, tested and signed off. When we left the Azores the warehouse was empty and no new jobs had been forecast! I was also rather astonished when I returned from Vietnam to be awarded the Bronze Star Medal. And lastly, when I returned from my final tour in 1975 from Malaya, Turkey, I was awarded the Meritorious Service Medal. Finally, I was awarded the Meritorious Service Medal upon my retirement. I demanded a parade instead of going quietly because I remember when I first entered the service and was stationed at Scott AFB there was a retirement ceremony every Saturday for some Master Sgt. or another where 10-12,000 were massed on the flight line to honor the retiree. I remember thinking this was just the right way to honor anyone who served over 20 years of honorable service. 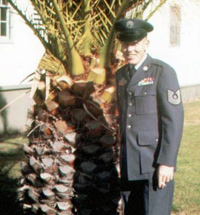 My first Air Force Commendation medal was awarded for meritorious achievement, the other five being awarded for service. I awarded the medal at Olmstead Air Force Base in Harrisburg, Pennsylvania. I headed a crew building and installing Control Tower equipment and transferring equipment at night while still keeping our operational tower functional during daytime operations. 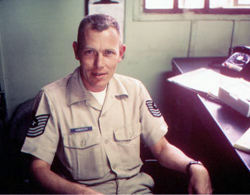 Lt. Col. Penney, Commander of the 2861st GEEIA Squadron who urged me to apply for OCS. I studied and took the test and successfully passed. The only problem was I was then too old to complete the school and therefore was ineligible for OCS. I met him again almost twenty years later when I attended the Senior NCO Management School in Montgomery, Alabama. 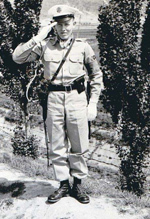 On my last tour at Malaya, Turkey, I was stationed on top of a mountain as the commander of a four-way Tropo/Microwave Radio site. In the winter-time we accumulated so much snow that our fence-line was covered and we essentially had no protection whatsoever. The snow accumulation gave us a neat downward slope to ski on and use our toboggans on. Somehow or other we started a radio broadcast with Incirlik, our support base. We made up a sort of ski jump and the final broadcast of that event was Kowalski who went down and did a one and a half somersault!!! It took a long time for anyone to realize that would mean he landed upside down. This worked so well that several weeks later, reading the Stars and Stripes a bunch of Airmen in Germany had set a record for the longest, continuous Ping-Pong game. Well, our site was manned at absolute minimum we began a tongue in cheek Ping-Pong game. As we approached the record I received a call that an AF Manpower Team was coming to visit us, as they had heard about our now infamous game. I finally ended it about two hours short of exceeding the record with by saying, “This morning at 3:30 am, during a heated match, Bailey stepped on our last ball, thus ending our attempt to beating the record.” That’s my story and I’m sticking to it. After military service, I went to work for a food service chain briefly, followed by seven years at Sperry Defense International. Most of my time was spent in Saudi Arabia building their Technical Training schools and installing the equipment. After a brief respite I was hired by the University of South Florida in Tampa to perform the duties of a Procurement Technical Assistance Specialist. I worked for the University teaching Federal contract law and how to do business with the U.S. Government for a little more than 18 years. This program was dedicated to assisting small business enterprises the ins and outs of Federal contracting, and then I finally retired. Concurrently I was a volunteer for the SCORE organization as a Federal specialist teaching Federal contracting procedures. I also served as the President of this organization for two years, and led this Chapter to the head of the District in meeting and exceeding the set goals. For a number of years I belonged to the National Contract Management Association and for four years served as a National officer. My last assignment was National Vice-President and Secretary. I sat on the Board of Directors, which included the Under Secretary of Defense, people from OFPP, et al. In the beginning I felt out-classed but soon realized in our discussions that my common sense was just as good, if not better than theirs. I also began teaching Federal Contract law at the University of South Florida’s Small Business Development Center. Over the course of the next 17 years I had taught over 25,000 people who had garnered almost $800 million dollars in Federal contracts. I retired from that job in 2004. Photo is of me at my retirement party. I have learned to be very detail oriented and will not quit any job until I see it through to the end. I have encountered many difficult tasks over my time since retiring, but I have never left any job unfinished. My wife at times questioned my determination, but in the end she understood why I as so determined. Go to the end!! The Air Force is a damned fine career and there’s not a better occupation that you could have chosen. Stick with and never look back. I thought at one time after I came home from Vietnam, that I had cheated myself a little, when I sat down with friends who had good paying jobs, settled in one house, and I was moving around the country, never knowing what was next. Now I know that I enjoyed my life a lot more than most of them did, and I certainly saw more of the world and how other people lived and know that I am much more ‘at home’ with my wife and family now. I have memories that will last a lifetime!! I don’t think I ever would have sat down and recalled so much of my career had I not joined TWS. It has been a wonderful experience to sit back and recall my 24 year career in the U.S. Air Force. For one thing my career would have never come about if it were not for my Dad. I had a good job offer at the end of my first tour of duty. I called my Dad and told him about it, and he insisted that the economy was bad and getting worse and I had better “damned well stay put.” I did and the rest is history.